Generally healthier and happier overall! As a parent of two young boys, I can also tell you that nature play is relaxing and fun! Here are the basics, as well as some great resources to get you started. 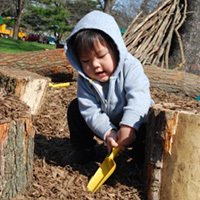 Authentic nature play is unstructured, imaginative, and open-ended. It encourages experimentation and observation. It also includes an element of age-appropriate risk-taking. Risk taking can be as simple as climbing, balancing, and jumping from a new height. While away-from-home nature areas might create some wonderful memories, you don’t have to travel away from your home to get the benefits of nature play. With a few simple additions, a backyard can include lots of the “good stuff” that is a part of nature play. One of the most inspirational guides I’ve read about nature play at home is the National Wildlife Federation's guide for Nature Play at Home. Every time I look at it, I get new ideas! You can also find great resources on the Minnesota DNR’s Arbor Month page. There are small adjustments to be made as you let your kids play in this way. For example, I’ve learned not to worry when the sand leaves the sand box. I’ve decided to allow the kids to dig a big hole in the yard, but I chose where to let it happen. I’ve let the kids harvest 'herbs' as a part of their imaginative games even if it means some of my plants take a beating. And, as the parts, pieces, forts, and rock piles move around it is certainly a bit messier than my pre-kid yard, but not any messier than most of my life. I smile (and take a seat on the porch steps) when I see how engaged and focused my sons and their friends can be in this environment. 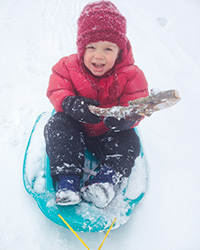 Remember, even when space is limited there are creative nature play ideas to adopt. Balconies are usually big enough for potted plants, a fairy village, a vine tee pee growing out of pots, or a small sand box. Bring loose parts inside. Fill baskets with rocks, tree slices, leaves, acorns, and other things you collect. They can be used as props for any storyline your young ones create. Bring snow inside in a tub to play with. Try painting it with watercolors, like this. Join your East Side St. Paul neighbors for the Urban Oasis Food Fest, a free community food festival. Watch a tomato-canning demonstration, gather menu ideas, and sample treats from East Side food vendors, August 17, noon–4 p.m., 740 Seventh Street East (St. Paul). Taking care of your trees benefits air quality, water quality, the urban heat island effect, property values, and more. Learn how to get your trees ready for winter and talk trees with other interested folks, September 13, 1-3 p.m. (drop in), Maplewood Nature Center. Installing a rain barrel is a simple, powerful way to protect our local waters. Join the Friends of the Mississippi River for a make-and-take rain barrel workshop, September 25, 6-7:30 p.m., Lakeville Area Arts Center.